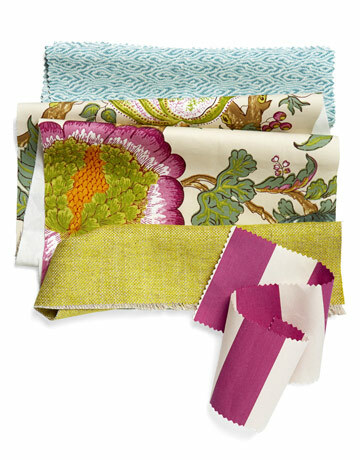 Los Angeles-based designer Joe Nye creates a room inspired by florals from Manuel Canovas's latest collection, and McKinnon and Harris furniture: "Using outdoor pieces inside — in a sunroom or even a living room — is fun and fresh." "I chose VANESSA'S FOLLY to line the striped curtains. Most people get lazy and just do white lining, but a contrasting color has a more finished, couture effect — like you thought about it." "BEAUVOIR is the key fabric in the room, the starting-off point. You can pull lots of colors from it. But you have to be careful not to overwhelm the room with it — it's not a timid pattern. I see it on a pair of duVal Club Chairs." "BRASILIA is a divine color, a wonderful mucky green, and the texture is really cushy. It's comfortable to sit on, even when you're in shorts, so I'd use it in a big way, on a sofa." "Striped curtains are always a winner, and a turquoise lining would really kick off the bright raspberry. With a bold stripe like ELOI, I wouldn't do much in the way of trim. You want to keep it fresh, not fussy like silk curtains." "These colors are loud and brash — but in a good way!" Nye says. "The pattern is a new take on an old standard, the Jacobean tree of life. It's fun, but it's busy, so it could get dizzying if you used a lot of it. The trick is to use it in a restrained way. On a pair of chairs, it would look special — it would be the focal point of the room." "It looks like a coarse sailcloth, but it's so soft you want to put your head on it. I would make two 22-inch-square pillows with tiny French pleats, one for each end of a sofa."